The story is simple and profound. The words are few, but right on the mark. I’m sure as you read it you’ll think something along the lines of, “I could’ve written this!” Perhaps you could’ve, but Leo Lionni got there first. The illustrations seem simple at first, but they’re not too simple. The watercolors used give the illustrations a beautiful but not completely static quality. 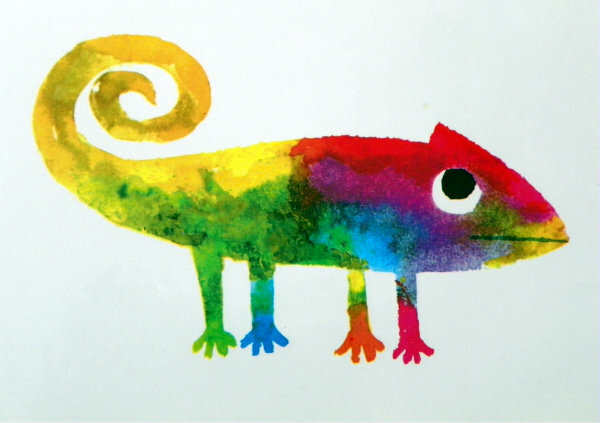 After all, a chameleon’s color isn’t exactly static, is it? The flap on the dust jacket calls this a “perfect color concept story for the youngest child.” I suppose it is, but that’s not why I love it. I adore this book because it’s so relatable to TCKs and their identity challenges. The chameleon struggles to determine its color. It thinks it has come up with a brilliant solution–and it is a pretty clever one–but it doesn’t work in the long run. Our friend the chameleon finally finds another chameleon to hang out with, and this changes everything for him. Isn’t that the way it is for TCKs? They don’t fit here and they don’t fit there the way others do. She may fit with her family, but she knows she can’t live with them foever. He may fit at his school this year, but it may be different next year. Finding other TCKs–finding others from the people without a geography–is when belonging happens. Just like the chameleon in the story, TCKs can find their own color and their own place, and it may all change throughout the journey. Color doesn’t necessarily matter nor does place when your roots and your sense of belonging are found in others who can relate to your story. A Color of His Own by Leo Lionni is marketed for young children, but don’t be fooled. It’s a beautiful and touching story for anyone who’s looking for the place to belong. For the TCK (and a few others) belonging is found in another, and not in a clump of earth. When do you feel like you belong?